The concept is simple and I don’t know why I didn’t get it – actually I think its because I skipped the first few chapters where all the explanation was found and jumped right into the frameworks. But now that I was able to listen to both Susan and Anne I understood the concepts much better. I even suggested after the session that they consider adding a DVD to the next edition so that they could go through the process like they had with us. They both seemed to like that idea. The process that follows is called the responsive phase which uses the students preconceptions and misconceptions to adjust teaching. To relate to the new NGSS, they would start with the DCIs and then on to the Cross Cutting Concepts and the Science practices. Ideally each learning target contains all three. They suggest teasing out the three domains into what they call “developing a story line”. Organize the order of the Learning topic by DCIs then address the cross cutting concepts (like Models for instance) then Practices (“develop and use a model based on evidence to illustrate the relationships between systems or between components of a system”) and then using all of that find a representation or activity to include. It truly is simple but pretty complex at the same time – but whats most important is that it makes sense. 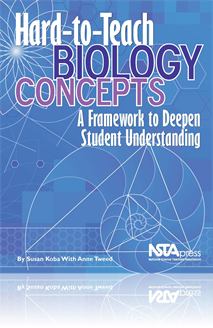 It is a systematic way to both address the concepts in science and the students thinking. I am also reading Page Keeley’s Curriculum Topic Study which seems to really fit into this approach, but more on that later.